One morning in early March, a good number of years ago, I boarded a train at Milan's Stazione Centrale. After crossing the border, the train glided across Switzerland, breaking the silence of meadows and woods sleeping peacefully under a thick blanket of snow. After the sun set, it became more difficult to follow the progress of my journey and I settled with my book. Around 10 pm, the train arrived at Cologne Central Station (Köln Hauptbahnhof) and I got off. The brisk air carried the memory of recent rain. I crossed the almost deserted main hall with my trusted companion: my beloved blue backpack. I knew what I would do once outside: look for a taxi and practice my best German to provide the driver with my destination address. I was not prepared for what happened when I stepped out onto the front sidewalk: The majestic Cathedral rose in front of me against the darkness of a starless night, serious in its dark gray attire, serene in its elegant Gothic style, gracious with its pointed arches and lofty spires, reassuring with the wisdom of its old age. I a had no idedid not know that the cathedral was so close to the train station and the shock of surprise was the sweetest welcome I could have received. I stood there for a time that stretched outside human time to look at one of the most beautiful buildings ever built, an example of human ingenuity, sense of place and space, faith and longing for the sky. The precise moment when my whole body and mind stopped mid-breath is the lasting impression of my first visit to Germany. Everything else I can tell you about the country is a combination of experiences and knowledge: that moment was pure and intense emotion. I did not have a camera back then, so I don't have a physical image of what my eyes saw. This photo is an excellent approximation. When I was finally able to awaken from the daze in which I was immersed, I realized that I was looking at one of the sides of the cathedral and that the facade (facciata, see top photo) was to the right (this aereal view shows the relative position of the two buildings). A few days later, I entered the Cathedral. Being inside a Gothic church was not a new experience for me. Beside the Gothic churches of my native Umbria, I knew well Milan Cathedral (duomo di Milano), being at the time a resident of that city. 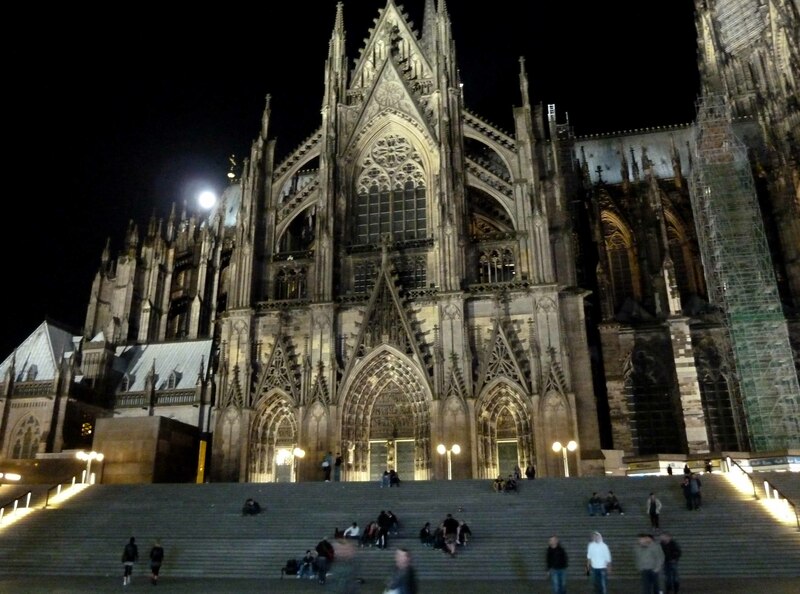 But the pull upward that I felt once I entered the Cologne Cathedral was much stronger than any I had experienced before. I immediately started looking up and kept my eyes there while walking around. This would have worked reasonably well had I been the only visitor of the sacred space. But as there were a number of other people and as all of them were walking around and looking up, bumping against each other was unavoidable. Nobody got upset, though, as we all realized that the occasional rough stop was an acceptable price to pay for the amazing feast the eyes were relishing while scanning the upper reaches of the cathedral. The two images above are from postcards I brought back from my trip. Beside images of the Cathedral, I have some from my visit of the Roman-Germanic Museum (Römisch-Germanisches Museum). Below is one of them. I spent three weeks in Cologne studying German. I owe to the school some nice memories I have from my stay, like a cruise on the Rhine on a boat of the water police (Wasserschutzpolizei). My visit to Cologne occurred before the reunification, so the capital was still Bonn, which I visited as homage to Beethoven. I went back to Germany a few years later, during a summer vacation with three friends: we drove from Italy to Norway and back so we had a chance to see quite a bit of Germany. We visited Ulm (where there is another fabulous Gothic church, the Minster, and where Albert Einstein was born), Göttingen, Heidelberg, Lübeck and Baden-Baden. My most recent visit to Germany was to Augsburg. But when I fly to Italy, I usually change plane in Frankfurt or Munich (there is no non-stop flight between San Francisco and an Italian airport), which allows me to stock up on my favorite chocolate-covered marzipan. Our virtual tour of the European Community is in Germany for three weeks starting today and I am the host. If you would like to join us for this stop of the journey, all you have to do is publish a recipe chosen from German traditional dishes. Do you need a bit of help to get your imagination started? On this wikipedia page there is a useful list. In your post, please reference the event, Abbecedario culinario della Comunità Europea (European Community Culinary ABC) and to the hosting blog by linking to this announcement. To submit your contribution (and you can submit more than one), please use the Inlinkz form at the end of this post. Archives posts are accepted, but please update them with the information of the event. Important: the form asks you for the URL of the post, the name (title) of the post and your email. The latter won't be published, but it's there for me to contact you, if necessary. Should you have any problems with the form, please send an email to simosite AT mac DOT com. You can also leave me the URL of your contribution in a comment to this post. The deadline is Sunday, December 29 at midnight PST. Feel free to contact me should you have any questions regarding the event and its rules. In recent posts (like this one), I have mentioned making Quark cheese at home. The immediate reason for that cheese-making adventure was to make Quarkkeulchen. Quark is a fresh cheese common in Germany, which is where I ate it first and last — before tasting my own. Making Quark at home is quite easy: take milk, add culture (see the recipe on this page, which contains a detailed explanation and lists various options for the culture) and let it do its work, then cut the curd, drain and you are done. Quarkkeulchen are Saxon pancakes made with potatoes (patate) and Quark. They require a bit of advanced preparation but are worth the effort. I honestly don't think I'll be able to go back to regular pancakes after tasting Quarkkeulchen. In preparation for my hosting duty, I read a number of recipes for Quarkkeulchen and made them many times, tweeking a detail or two every time, for the joy of my breakfast-loving husband. Among the various sources of inspiration, I want to recognize in particular the recipe by Meeta of What's for Lunch Honey?. Her post is informative and her photos are gorgeous. My version uses the same amount of potatoes and Quark and relies on plump California raisins (uvetta) for sweetness. I serve Quarkkeulchen with my applesauce, which, based on my reading, is a traditional accompaniment. Note: if the Quark you use is very moist, drain it a bit by placing it on a cloth-lined strainer placed over a bowl (to catch the whey). Weigh it after draining. If later on, before you add the beaten egg white, your batter is quite stiff, add back as much of the drained whey as needed to soften it. Break the egg and separate yolk and white. Boil at least 100 g potatoes until tender. For efficiency's sake, I usually boil more and use what I don't need for this recipe to make mashed potatoes. As soon as you can handle, peel and run through a ricer or mash finely. Weigh the amount needed. Place in a bowl and let cool. Add egg yolk, sugar, Quark, flour and orange zest to the potatoes and stir well. Add the raisins and stir in. Whisk egg white with the pinch of salt until firm. Gently fold the egg white into the batter. Let the batter rest in the refrigerator for 20 minutes. Warm up a skillet and oil it well. Warm up the oven to 190 F / 88 C and place an oven-resistant plate in it. Using a soup spoon, drop about 2 tablespoons of batter into the hot skillet and gently flatten with the back of the spoon to form a circle. Repeat to make four more Quarkkeulchen. Fry until they are golden (two minutes or so) then flip and repeat on the other side. Transfer to the warmed plate and keep in the oven. Oil again the skillet if necessary. Use the rest of the batter to make another batch of five Quarkkeulchen and cook as described above. Serve immediately with roasted applesauce. The delicate flavor of Quarkkeulchen blends potato and Quark and is punctuated by the sweet burst of raisins. Each tender bite is quite satisfying. The roasted applesauce is a perfect accompaniment: its fruitiness goes well with the raisins and its natural sweetness does not overwhelm the delicate flavor of the Quarkkeulchen. An excellent breakfast fare. 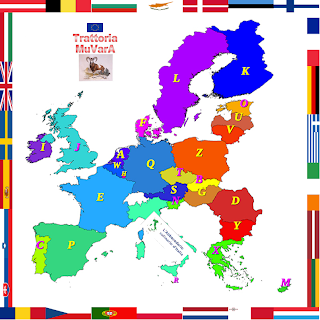 With this post, I introduce the 17th installment of the Abbecedario culinario della Comunità Europea (European Community Culinary ABC), an event organized by Trattoria MuVarA that will bring us to visit 26 countries of the EU (all except Italy) using the alphabet as guide. Q like Quarkkeulchen (Germany) is hosted by me, Simona of briciole. My recipe for Quarkkeulchen and the list of recipes contributed to the event. or launch the Q come Quarkkeulchen audio file [mp3]. Una mattina di Marzo di un buon numero di anni fa salii su un treno alla Stazione Centrale di Milano. Dopo aver passato il confine, il treno attraversò la Svizzera, rompendo il silenzio di prati e boschi addormentati sotto una spessa coltre di neve. Dopo il tramonto divenne difficile seguire il progresso del mio viaggio e mi accoccolai col libro che stavo leggendo. Intorno alle 22 il treno arrivò alla Stazione Centrale di Colonia (Hauptbahnhof) ed io scesi: ero arrivata. L'aria freddolina aveva tracce di pioggia recente. Attraversai la hall quasi deserta con sulle spalle il mio fido zaino blu. Sapevo cosa avrei fatto una volta fuori: avrei cercato un taxi e, sfoderando il mio miglior tedesco, avrei dato al tassista l'indirizzo della mia destinazione. Non ero preparata per quello che mi successe una volta uscita dalla porta a vetro: il maestoso duomo si ergeva davanti a me sullo sfondo di una notte senza stelle, serio nel suo abito grigio, sereno nel suo elegante stile gotico, grazioso con i suoi archi a sesto acuto e le torri svettanti, rassicurante con la saggezza della sua venerabile età. Non sapevo che il duomo fosse così vicino alla stazione e lo shock della sorpresa fu il benvenuto più dolce che potessi ricevere. Rimasi lì davanti per un tempo fuori dal tempo ad ammirare uno degli edifici più belli mai costruiti, un esempio della creatività umana, di senso dello spazio, fede e desiderio di volare. Il momento preciso in cui il mio corpo e la mia mente si fermarono a metà di un respiro è il ricordo più duraturo del mio primo viaggio in Germania. Tutto quello che posso raccontarvi di questo paese è una combinazione di esperienze e conoscenze: quel momento fu emozione pura. A quel tempo non possedevo una macchina fotografica, quindi non ho un'immagine fisica di quello che videro i miei occhi quella sera. Questa foto è un'approssimazione ottima. Quando finalmente mi scossi e tornai alla realtà mi resi conto che stavo ammirando uno dei fianchi del duomo e che la facciata (vedi foto iniziale) era a destra (questa veduta aerea mostra la posizione relativa dei due edifici). Pochi giorni dopo visitai il duomo. Trovarmi all'interno di una chiesa gotica non era un'esperienza nuova: oltre alle chiese gotiche della mia nativa Umbria conoscevo bene il duomo di Milano, essendo al tempo residente di quella città. Ma l'impulso a guardare in alto che ho sentito dentro al duomo di Colonia fu molto più forte di quanto provato fino ad allora. Immediatamente rivolsi i miei occhi verso l'alto e li tenni lì mentre andavo in giro per la chiesa. Il problema era che a camminare col naso verso l'alto non ero solo io ma anche tutti gli altri visitatori, quindi collisioni accidentali erano inevitabili. Ma nessuno ci rimaneva male: un occasionale arresto brusco era un prezzo accettabile da pagare per ammirare la bellezza elevata dell'interno del duomo. Trascorsi tre settimane di a Colonia a studiare tedesco. Ho dei ricordi simpatici dei giri fatti con la scuola, come la crociera sul Reno a bordo di una barca della polizia fluviale (Wasserschutzpolizei). La mia visita avvenne prima della riunificazione, quindi la capitale era ancora Bonn, che visitai come omaggio a Beethoven. Tornai in Germania alcuni anni dopo, durante una vacanza estiva con tre amici. Andammo in auto dall'Italia alla Norvegia e ritorno, quindi avemmo modo di vedere un bel po' di Germania. Visitammo Ulm (dove si trova un'altra splendida chiesa gotica, il Minster, e dove nacque Albert Einstein), Göttingen, Heidelberg, Lubecca e Baden-Baden. La mia visita più recente è stata ad Augsburg. Ma quando vengo in Italia di solito cambio volo a Francoforte o Monaco (non ci sono voli diretti tra San Francisco e un aereoporto italiano), il che mi consente di fare rifornimento dei miei cioccolatini di marzapane preferiti. Il nostro viaggio virtuale attraverso i paesi della Comunita Europea si ferma in Germania per tre settimane a cominciare da oggi e io ospito questa tappa. Se volete partecipare, pubblicate una ricetta tradizionale tedesca sul vostro blog. Nel post, fate riferimento all'evento, l'Abbecedario culinario della Comunità Europea, e al blog ospitante. Utilizzate l'Inlinkz in fondo a questo post per inviarmi i vostri contributi. Potete contribuire post del vostro archivio, ma per favore aggiornateli con le informazioni sull'evento. Importante: il modulo chiede l'URL del post, il nome (titolo) del post e il vostro indirizzo email. Quest'ultimo non viene pubblicato ma mi serve per contattarvi se necessario. Se avete problemi col modulo Inlinkz, scrivetemi a simosite AT mac DOT com oppure lasciatemi un commento a questo post. Scrivetemi pure se avete domande o dubbi sull'evento e le sue regole. In recenti post (come questo), ho detto di aver fatto il formaggio Quark in casa. La ragione principale per tale avventura casearia era la preparazione di Quarkkeulchen. Il Quark è un formaggio fresco popolare in Germania, dove l'ho mangiato la prima volta e anche l'ultima — prima di produrre il mio. Non so se si trovi in Italia, ma farlo in casa è piuttosto facile: si prende del latte, si aggiungono i fermenti (la ricetta su questa pagina, in inglese, contiene una spiegazione dettagliata di varie opzioni per quanto riguarda i fermenti), si fa riposare il tutto, poi si taglia la cagliata, la si fa drenare e il Quark è pronto. Quarkkeulchen sono delle frittelle tipiche della Sassonia preparate con patate e Quark. Richiedono un po' di preparazione ma vale la pena perché sono ottime per una colazione speciale. In vista per il mio ruolo di ospite, ho letto diverse ricettedi Quarkkeulchen e le ho preparate molte volte, ogni volta aggiustando uno o due dettagli, per la gioia di mio marito, che ama una colazione sostanziosa. Tra le varie fonti di ispirazione, desidero citare in particolare la ricetta di Meeta del blog What's for Lunch Honey?. Il suo post contiene molte informazionie e le foto sono bellissime. La mia versione utilizza la stessa quantità di patate e Quark e fa affidamento all'uvetta della California per fornire dolcezza naturale. Servo le Quarkkeulchen con la mia salsa di mele, che, in base a quanto ho letto, fa parte della tradizione. Nota: se il Quark che utilizzate è molto soffice, drenatelo un po' mettendolo in un colino foderato di cotone e posto sopra una ciotola (per raccogliere il siero). Pesarlo dopo averlo drenato. Se poi, prima di aggiungere l'albume montato, il composto risulta molto compatto, aggiungete di nuovo il siero necessario per renderlo morbido. Rompere l'uovo e separare tuorlo e albume. Lessare almeno 100 di patate fino a quando sono tenere. Per amore di efficienza, io di solito lesso più patate del necessario e poi con quelle che avanzano faccio del purè. Appena possibile, pelare le patate e passarle con lo schiacciapatate. Pesare la quantità necessaria, metterla in una ciotola e far intiepidire. Aggiungere alle patate il tuorlo, lo zucchero, il Quark, la farina e la scorza d'arancia grattugiata. Mescolare bene. Aggiungere l'uvetta e mescolare. Aggiungere il sale all'albume e montare a neve ferma. Incorporare con delicatezza l'albume al composto di patate e Quark. Far riposare il composto in frigorifero per 20 minuti. Scaldare una padella ben oliata. Scaldare il forno a 88 C e metterci un piatto resistente al calore. Con un cucchiaio, versare 2 cucchiai circa (30 ml) di composto nella padella e schiacciare leggermente con il dorso del cucchiaio per formare una frittella rotonda. Ripetere altre 4 volte. Friggere da entrambi i lati fino a quando siano belli dorati (2 minuti circa per parte). Trasferire sul piatto caldo e tenere nel forno. Oliare di nuovo la padella, se necessario. Utilizzare il resto del composto per fare 5 Quarkkeulchen come sopra. Servire accompagnate da salsa di mele arrosto. Il sapore delicato delle Quarkkeulchen nasce dal connubio di patate e Quark ed è punteggiato dalle piccole esposioni di dolcezza dell'uvetta. Ogni morbido boccone è una soddisfazione per il palato. La salsa di mele è una compagna perfetta: il suo sapore fruttato richiama quello dell'uvetta e la sua dolcezza naturale non sopraffa il sapore delicato delle Quarkkeulchen. Un piatto per la colazione davvero ottimo. Con questo post introduco la diciassettesima tappa dell'Abbecedario culinario della Comunità Europea, un evento organizzato dalla Trattoria MuVarA che ci porterà a visitare i 26 paesi della Comunità Europea (eccetto l'Italia) usando le lettere dell'alfabeto come guida. Q come Quarkkeulchen (Germania) è ospitata da me, Simona di briciole. La mia ricetta per Quarkkeulchen e la lista dei contributi all'evento.